Right up front I need to say this: in early 2014 the Fujifilm X-T1 was one of the most hyped, most discussed cameras in the market. If you’re one of those that believed the hyperbole and bit on all the marketing lines, you’re probably not going to like this review. As always, I review products after pragmatic and relatively tough use. No product is perfect, so I’ll be describing some “warts” along the way. My goal, as always, is to describe the product and its use as best as I can from the vantage point of using the gear in a variety of actual work conditions. One of the things the camera companies now seem to be trying hard to do is to evoke visceral reactions that will make you buy on more than just functional differences. The whole “retro style” thing that the X-T1 uses falls into this category, for example. Maybe you’ll buy a camera if it looks and feels more like the camera you used in the 80’s or 90’s (or 70’s for some of us more elder statesmen). I’m of a different notion to this, though. I appreciate “retro” when it is using design that wasn’t broken. I don’t appreciate “retro” when it’s just nostalgic and there are better solutions. I’ll have much more to say about that in the handling section, below. The Fujifilm X-T1 is the sixth in the series of X cameras Fujifilm has produced, so you’d expect that with all those predecessors that it would be refined. Much of the guts of the camera come from the X-E2, though even those have been refined. What a lot of folk didn’t expect with the X-T1 was something that looked a lot so much like a small, older film SLR. After the original X-Pro1 and its strong legacy type look and controls, Fujifilm had tended towards a much more modern look and softer style with their mirrorless cameras, with some of the models even forcing the company to deviate from having aperture rings on the lenses due to the lack of some controls. It seemed like the move was away from retro focused towards something that used retro elements. Those that found the original X-Pro1 appealing were once again excited by Fujifilm’s all-in retro approach when the X-T1 launched in January 2014. Lots of dials. Lots of buttons and other controls. A traditional SLR look, with a modest hand grip instead of the massive ones of many DSLRs. A modest but retro-angular prism hump! All housed within a magnesium alloy body. But the “goodness” didn’t stop there. Besides that full set of controls, dials, and the classic look, there were other surprises in the mix. First, there was a bigger, faster, better EVF sitting in that film SLR-like prism hump. That EVF is OLED, which gives it a good brightness, has a very fast refresh rate, allows for a digital split image for manual focus, has almost 2.4m dots, and with a very big 0.77x magnification it makes the view through it look impressively like that of a larger DSLR. Indeed, the view is so large that with my glasses on I can just barely take it all in: it really does fill my eye. Next, the camera is weather sealed (75 gaskets) to protect against dust and water, plus it is freeze resistant. However: note that Fujifilm doesn’t currently have any similarly sealed lenses; they will come later. WiFi is built in, as are the usual video capabilities (including a 36Mbps bit rate, which is higher than the AVCHD cameras). We’ve also got a nice 1m dot tilting LCD on the back. One thing that should please Fujifilm fans is the support for UHS-II cards—the X-T1 is the first camera from Fujifilm that can write state-of-the-art fast to a card. The mechanical shutter goes from 30 seconds to 1/4000, but with a rather slow flash sync speed of 1/180. While the menu lists a silent mode, that’s really about the beeping for focus confirmation and other feedback the camera gives. That said, the shutter is relatively quiet, even when firing off continuous bursts. Certainly more quiet than my Nikon DSLRs, even when they’re set to Quiet Mode. Yet it wasn’t those attributes that got all the attention. Instead it was the claims for focus performance and the 8 fps continuous shooting speed (only 3 fps though with live view). The section heading in the Fujifilm press release was labeled “World’s fastest AF speed” and the prose used phrases such as “world-beating response.” That’s exactly what the mirrorless world was seeking: a camera that could unseat the DSLRs in terms of focus. Yes, this is marketing. Marketing wants to show off their new offering in the best possible light. However, so many camera companies have now made this “fastest” claim that the actual claim usually is evaluated as meaningless by the consumer who knows better, and that’s the target customer for the X-T1. Still, I can’t believe how many people who should know better fell for the suggestion that the X-T1 might outshoot DSLRs. As you’ll find, the reality is a bit different. Not to say that the Fujifilm is slow to focus—it isn’t—but you really need to evaluate speed claims made in marketing materials very, very carefully. I’ll be doing some of that later in this review in the performance section. One thing the X-T1 doesn’t have is a built-in flash. Instead, you get a bundled standalone EF-X8 flash with a reasonable Guide Number of 25 ft (8m at ISO 100). The EF-X8 gets its power from the camera, though, so expect worse battery performance when using it. The usual flash features are supported (including rear sync). Fujifilm has also provided a useful studio trigger mode that disables the pre flash sequence. However, they’ve named this confusingly “commander mode.” It’s not the kind of commander you might be use to with Canon and Nikon (and even a few other maker’s) flash systems, though. The X-T1 also has a standard PC Sync socket (under one of those tiny covers that you’ll eventually lose; I actually bought a dozen of those for my Nikon bodies before Nikon went to a different style for covering the sync socket that doesn’t get lost. Inside we have the same 16mp X-Trans APS-sized sensor technology Fujifilm has been using for a couple of years now, though the sensor has phase detect capabilities built onto it now. For those that haven’t been following the plot, the X-Trans sensor uses a different color layout than a Bayer sensor, with more green photosites than Bayer, but also fewer red and blue photosites than a Bayer sensor. What that means is a better job at luminosity and noise handling at the sacrifice of color sensitivity. It also means that we still have the same potential color smearing issues to deal with. See my X-Pro1 review for more details; nothing has really changed with most of the raw converters since I wrote that; I’ll have more to say in the performance section. For those not familiar with the sensor, it’s listed at ISO 200 base with a maximum of ISO 6400 for raw shooting. Fujifilm allows JPEG shooters to set ISO 100 to 51,200. Indeed if you set a value outside the ISO 200-6400 range, the camera will stop shooting raw if that was your choice. Not the right choice in design, as far as I’m concerned, though the ISO dial is locking, so you won’t do this accidentally. The 16mp nets you 4896 x 3264 images, which you’re recognize as 3:2 format. You can also set 1:1 and 16:9 aspect ratios while shooting. Frankly, this should be an easy feature to implement, so why you can’t also set 5:4 (standard photo ratio), 4:3, and maybe even sub-crops like 1.2x or 1.3x I don’t know. True, such a range of choices would add complexity to the camera, but this camera is targeted at a user who understands and will master that complexity. Fujifilm does not perform image stabilization at the sensor. Instead, they rely on lens-based stabilization ala Canon and Nikon. Look for OIS on the lens. Of course many of the Fujifilm primes don’t have OIS, so if you’re mostly a prime shooter, you’re not likely going to have stabilization available to you. Video users aren’t going to be overly impressed by the features, though we do have 1080P/60/30 as well as 720P/60/30. There isn’t a headphone jack, for instance, and the microphone jack is actually shared with the remote control, which requires that you change a setting on the camera to go back and forth. At first I couldn’t figure out why my remote wouldn’t work, but it turned out that the default was microphone for that jack. You can also use a smartphone app via WiFi to do basic control of the camera. At a bit less than a pound (440g) and modest overall dimensions, the X-T1 is tackling the prosumer crop sensor cameras of Canon (70D) and Nikon (D7100), but in a smaller, lighter package. The camera is virtually the same size as the Olympus OM-D E-M1, by the way. The battery used in the X-T1 is the NP-W126, which is rated to 350 shots CIPA, which is wimpy for a performance camera. Remember, using the supplied flash could cut that significantly. Price of the camera (body only) is US$1300, or US$1700 with the 18-55mm kit lens. The camera is made in Japan. The X-T1 is well made. There’s a substance to it without being heavy. The rubber (connector area) and plastic (card, battery) doors are an odd mismatch to the otherwise sturdiness of the build quality. The ISO and shutter speed dial have locks on them. The ISO dial always requires a press of the central button on the dial to move it. As I noted, if you stay with the marked ISO values (200-6400) you can shoot raw, but if you move outside that (L, H1, H2), the camera will default to JPEG images regardless of what you’ve set. There’s also an A position for Automatic ISO. Auto ISO has a default sensitivity, maximum sensitivity, and minimum shutter speed associated with it, all set via menu options. The shutter speed dial locks in the A (automatic) position, otherwise it can be rotated freely. Besides the usual one-stop apart values we have a 180x position for flash use, plus T (time of 2 to 30 seconds) and B (bulb). Shutter speeds go down to 1 second on the dial. Note that unlike the Nikon Df, the X-T1 doesn’t really lie to you about shutter speed. If the dial is set to anything other than A, what you see is what you get as your shutter speed. If you need to override that in partial stops, you can via the rear dial, but you’re never far from the actual speed listed on the dial. That’s retro properly done (as opposed to the Nikon Df’s improperly done method). Exposure compensation is controlled by a dial at the right top edge of the camera (+3 to -3 EV). This dial is stiff and doesn’t stick out past the edge of the camera, so it’s not prone to being accidentally moved, though it can be if you try hard enough ;~). I’m not a fan of location of the 0 position as you have to tilt the camera top back towards you to be sure you’re at zero. I would have preferred it to be at the back edge of the camera with a bigger and more obvious alignment marker. But that’s just me. The shooting method dial is under the ISO dial, while the metering method dial is under the shutter speed dial. Unlike Nikon, Fujifilm has correctly made the settings obvious from the back of the camera. Another example of retro done right. However, as with many of the dials on the X-T1, these two dials can get out of their click stops to an intermediary and indeterminate position. It’s not a big deal, but absolutely make sure that as you move the lever for these dials you’re stopping at click positions, and it probably pays to make sure the camera is still in click positions when you take it out of a bag or after roughly handling it (these dials don’t lock). Two command dials (front and rear) are available, though they’re mostly underutilized. The front one allows you to select finer shutter speed options (and the T setting), the back one controls apertures on XC lenses. You can swap the functions via a menu setting (which Nikon users will likely want to do, as Nikon default is aperture on the front dial, shutter speed on the rear dial). The only other use of the dials is during image playback (back = magnification, front = image). Probably the number one issue people complain about with the X-T1 is the Direction pad buttons. They’re recessed (more so on the original bodies than on the latest builds, but still more recessed than on most cameras). Large fingers and gloves don’t do well with those controls, and frankly, they hurt the focus system, too, as they’re difficult to find by touch and just not as useful for moving the focus sensor as on many DSLRs. They also have a very short press that has little tactile feedback, thus even if you think you found the right button, you’re not always sure that you pressed it. On the other hand, we don’t have the “accidental setting” problem that a lot of cameras have with buttons that stick out. Still, it really shouldn’t be a “choose our poison” type of thing with Direction pad buttons. They should be obvious by touch and easy to distinguish, and they shouldn’t accidentally change a setting. There are cameras that achieve this, so it isn’t impossible. Yet we keep seeing mirrorless and small cameras that get this wrong in some way. The shame is that the X-T1 is well sealed and designed to operate in cold temperatures. You know, those times when there’s snow on the ground and you’re wearing gloves? Only problem is that the Direction pad just isn’t glove friendly. Not even close on my sample. That kind of dissonance in design really is a serious miss in my book. It’s great…but it isn’t. Where was the product manager who noted the team that was doing the sealing versus the team that was doing the button and control designs were in contradiction? Great design takes someone who is managing all the details such that they don’t come in conflict like this. As Steve Jobs pointed out, great design isn’t about how something looks, it’s about how it functions for the user. The Direction pad on the X-T1 is a big weak spot. That’s a disappointment, because otherwise the handling of the X-T1 is quite good. A quick glance from the top of the camera and you can tell what your ISO, shutter speed, exposure compensation, and aperture are. Oh, wait. You can’t always tell the aperture because Fujifilm seems to be making more lenses these days with unmarked aperture rings. I think they got this wrong, too, and it’s the curse of the consumer cameras and lenses causing design issues with the high-end ones, which isn’t so great for a product targeted at sophisticated users. The move to the switch and an unmarked aperture ring for the variable aperture lenses seems wrong to me on cameras targeted towards the high end. True, there’s no perfect solution for a variable aperture lens, but we now have a fixed-aperture prime lens without an aperture ring, so Fujifilm is really more worried about the consumer camera users than the high-end ones. 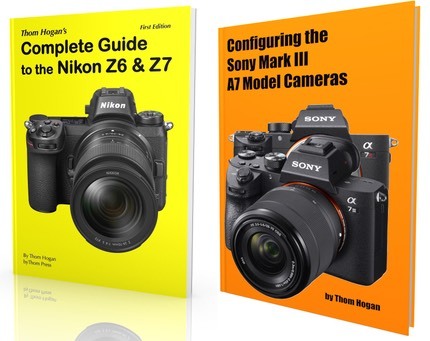 Going between the X-T1 and a Nikon D7100 (crop sensor DX) is more like going between a full frame camera and a crop camera in terms of the viewfinder view due to the large magnification involved on the X-T1’s EVF. I really doubt that people are going to find fault with the EVF (other than a few of the things that are inherent to EVF itself, such as a slight lag to reality and the disturbance of night vision). One other nice touch: the ability to set the EVF to be the only display active, but to turn it off if the eye is not at the viewfinder. This is a biggie given the X-T1’s relatively wimpy battery. The EVF has a rubber eye cup that doesn’t protrude much, which is good, because if it did I wouldn’t be able to see the full display with my glasses on (you can have it “squeeze” the image area a bit by pressing the DISP button and using the menu options that pop up). Fujifilm has also done some things with this EVF we haven’t seen before, most notably changing the data displayed to reflect portrait mode when you hold the camera vertically. Very nice touch, and soon to be copied by everyone else, I hope. There’s also a dual mode, which gives you an enlarged split screen of the central focus area next to the whole image, and which can display peaking or Fujifilm’s unique “split” function, which is reminiscent of the old split prism finders in film SLRs. I’ll give Fujifilm full marks for creating innovative, unique, and useful viewfinders. The X-Pro1 and now the X-T1 show a lot of attention to detail at the viewfinder. Out back, the LCD tilts, but not a lot (90° up, not quite 45° down). As others have noted, this is a tripod friendly tilt, as the LCD never swings lower than the bottom of the camera. Finally, we come to the menus. We have 8 menus of 7 items, for 56 things to scroll through. Some of the items also contain subitems. While the menu system is simple and Fujifilm’s naming not nearly as cryptic as it is on some cameras, I get a sense of randomness as to where things are. Why, for example, is Self Timer and Intervalometer on the same menu (2) as white balance, color, sharpness, highlight tone, and shadow tone? While there’s organization to the menus, it also appears that Fujifilm fell prey to the “only have seven items a menu” problem. My guess is that Fujifilm put the things they thought you most likely to want to set on the first menu, and then just continued prioritizing right down through the fifth Shooting menu. But you might question that prioritization. Flash exposure compensation, for example, falls to menu 4, and you can’t assign it to a function button, which is an odd omission. Also, Fujifilm doesn’t wake the camera on a Menu button press if it’s in power conservation mode. You have to press the shutter release part way to get the menus accessible again. That’s also true of the Playback button, too. This should be changed. Nit: the AF-L button is far too small and tough to find (and another not-glove friendly button). It sits in an awkward position just above the ridge in the thumb rest on the back of the camera, is very small, and again has a design that makes it tough to find quickly by touch. For a camera that touts its focus performance, we need controls that allow us to tweak that performance in real time that are right where we want them and easy to find. The Focus Assist button is also tough to find, as its recessed into the rubber on the back. At least the focus method switch on the front is easy to find, but again, it’s too small and very much not glove friendly. One thing Fujifilm should be applauded for is being the first Japanese camera company to realize that we use Arca-style plates on our high-end cameras: the optional MHG-XT grip actually comes with the proper dovetail already on it. Bravo. Now if all the other companies would stop making silly plastic, misshapen, and other flawed grips but rather sturdy ones that lock down to an Arca clamp, us curmudgeons would be a lot less grumpy. Overall the X-T1 is more retro than previous X cameras, yet it gets most of that very right. The big handling complaint from most users is going to be the small, hard to find buttons that don’t give a lot of feedback. Battery: I’ve actually been doing a bit better than the CIPA numbers on my X-T1, getting a bit over 400 frames a charge it seems. Still, that ain’t serious DSLR territory, so extra batteries are the name of the game for X-T1 users. Write to card: Okay, Fujifilm has moved up in the world. Sort of. First of all, the X-T1 has a useful buffer size (20+ images in raw modes, 40+ frames in JPEG modes). Even at 8 fps you have a couple of seconds of buffer, minimum. Fujifilm cameras (dating all the way back to the S1 DSLR) have had a reputation for slow writes to cards. Unfortunately, that’s still a bit true. Buffer full writes of raw files were still taking 30-40 seconds on most of my 45MBs UHS-I cards. However, stick a UHS-II card that has faster performance in and the times came down by at least a third, a much more reputable performance. JPEG shooters will see the buffer clear about twice as fast as raw shooters, despite the fact that there are twice as many images in the buffer. Part of this is the huge size of the X-T1’s raw frames: 32MB. Now that Fujifilm is using more state-of-the-art card writing performance, someone now needs to look into lossless compression for those raw files. My D800 can write its 36mp raw files smaller than the X-T1 does its 16mp ones, and it writes them faster, too. Bottom line: if you shoot raw, invest in the most current state-of-the-art SDHC cards (e.g. UHS-II with a high transfer rate). Absolutely avoid cards that are pre-UHS-I and less than 45MBs. Autofocus: Okay, some more warts are about to appear. First, let me say that the basic focus performance is indeed quite good, and better than the X-E2 and many other mirrorless cameras. Still, it doesn’t match (let alone top) a good DSLR or even the Nikon V3. Fujifilm’s “world’s fastest AF” claim will always have a footnote, it seems, and a significant one at that. The change that Fujifilm made from the X-E2 is that focus and metering adjustments can be taken at the same time the camera is shooting (at up to 8 fps). This has definitely improved tracking over previous models, and often gives DSLR-like performance for certain types of subjects. However, note that this kind of tracking only happens with the nine most central AF sensor areas. First wart. We can move the AF area to 49 positions (7 x 7 grid that comes close to covering the full frame). But to do that at the defaults you have hit the down button on the Direction pad and then use the Direction pad buttons to move it (did you find those with your thumb easily? No). The problem is that the minute you go active with the shutter release again, we pop out of that “setting mode” and the Direction pad buttons now revert back to their normal uses (film simulation, macro, and white balance). Yes, you can program all the Direction pad buttons to “Focus Area,” but this isn’t quite what you think it is: basically you have to then press any of the Direction pad buttons to get to “focus area control” then use them to control direction. Basically a double pump on buttons that are difficult to find by feel. This is one of those points at which the underutilization of the command dials comes into play. Basically, we need something faster to control where focus is acquired in real time, otherwise the tendency is that we just use the center focus area all the time. Second wart. Then there’s the fact that we’re using an EVF. Despite the fact that the X-T1 uses an EVF with a very fast refresh rate, we still have a slight lag, and that’s especially noticeable when you’re shooting continuously on a fast moving subject that moves past you. The tendency is to tend to fall a bit behind on framing, which may impact your focus tracking. This is only a potential wart, though. What I discovered in the Galapagos is that I just have to practice to better learn how to anticipate that slight lag. I judge this as something that someone committed to the camera isn’t going to have problems with over time. However, note that a lot of people who pre-ordered the X-T1 based upon Fujifilm’s promises on focus performance ended up returning it. One of the reasons for that I’ll bet is that they didn’t give themselves enough time to both learn how to set the camera appropriately, nor accustom themselves to the slight visual lag in the EVF. Which brings us to lenses. It’s clear that Fujifilm has put out some lenses that aren’t up to the camera’s capabilities. The two lenses that come to mind the most are the 60mm macro and the 55-200mm telephoto. But especially that macro. What happens with some lenses is that the initial move to “focus” is what I would call leisurely. Instead of snapping to focus you can actually see the focus transitioning to position. This was my biggest issue with the 55-200mm: initial focus acquisition speed. Once focus is acquired, even the slow-to-focus lenses tend to follow well. But here’s the rub: if you lose focus during a sequence (lost framing for a moment) and trigger another focus reacquisition, you’re basically hosed with the slow-to-initial-focus lenses. Let the shutter release go and start over. Sir, let the shutter release go. Most of the primes are very fast to focus and don’t have this issue (which is why Fujifilm made their claim with the 14mm, which doesn’t move the focus elements much at all ;~), nor does the 18-55mm. So some folk will find the X-T1’s focus performance great and DSLR-like. But if you’re thinking the X series is ready for serious long-lens work, it’s not there yet in my opinion. That’s got to be partly due to the lens design, not the camera, so as Fujifilm releases their more pro telephoto options in the coming months, maybe this will improve. Another interesting thing about focus is that tracking may slow the frame rate. This was a real surprise to me when I first encountered it. The camera started at 8 fps but I was getting sequences that were more like 4 or 5 fps. Say what? It turns out that with faster moving subjects the camera won’t shoot until the lens has caught up moving the focus position. In a way this is a bit of what we Nikon shooters would call “setting AF-C to Focus Priority.” While there is a “Release Priority” option on the X-T1, it still slows the shooting rate down when invoked, particularly with long lenses like the 55-200mm. In some cases I saw no tangible difference between frame rate of Focus Priority and Release Priority. This may or may not be a wart depending upon how you expect the camera to perform. Personally, I’ve harped on “timing” with continuous shooting before, and Fujifilm’s slow-the-camera approach just makes things worse. If I’m taking photos of continuous action, I really want to try to anticipate and capture the action with a single frame. I’m not a huge fan of burst shooting because it basically decouples the shooter from the timing of the shots. When I do shoot bursts, they’re typically short and start with what I think is the proper timing; the extra few shots give me some alternatives in case I’m wrong. The reason why most of us ask for higher frame rates when we do rely upon burst shooting is that the more frames per second, the more likely you’re going to get—or at least get “near”—the best moment possible. That’s why I’ve often been shooting the Nikon 1 for sports lately. 20 fps with continuous focus, 60 fps without. Much more likely that a burst will get the “magic moment” than 4 fps. Fujifilm’s slowing the burst to achieve focus puts a randomness into the slowing of the burst rate, making it less likely that you get the peak motion on continuous shooting. Face Detection overrides your focus area selection: you can only set the center point. Surprisingly, I found that this function often worked on some animals I wouldn’t have expected it to (birds), but not reliably so. As with most face detection systems it seems like voodoo when it works, but it doesn’t always work. You need reasonable light on the face and a face that is facing you most of the time. Image Quality: I keep getting flack for writing about the X-Trans sensors’ shortcomings. I’m going to praise it a bit more this time, but only a bit, and not because of anything Fujifilm themselves have done. It’s just that raw converters have caught up a bit to where they should be with the X-Trans layout. Adobe has worked with Fujifilm and it now gives a better, but still not state-of-the-art raw conversion. A few other converters seem to do better jobs; for example Iridient Developer, though they haven’t quite got the “Fujifilm color” dialed in right. It seems that in the intersection of color rendering, detail, and tonality, no one has gotten all three “right” for the X-Trans sensor. While Fujifilm fans often proclaim about how wonderful the JPEGs are, I find them a bit contrasty, often with shifts in white balance, while fine detail (especially in greens) is a bit on what I’d call the smudgy side. Then there’s the classic Fujifilm double hue shift, which makes it more difficult to change color values after the fact should you want to. No doubt there is drama in the out of camera JPEGs, but it’s not the best image the camera can create, IMHO. What that best is will depend upon how good you are at raw conversion and which converter you use. In terms of detail, Iridient Developer seems to pull out the most detail and color and tonality. Capture One does a pretty nice job, too, with better color and tonality and a slight drop in detail. The worst of the bunch in my opinion is the one most people would try to use: Lightroom or Adobe Camera Raw. I said I felt that the JPEGs from the camera tended to be a bit smudgy in the pixel level detail. Well, Adobe makes it worse. ACR on top, Irridient Developer with deconvolution sharpening on bottom. It may be difficult to see via a JPEG handled with this site’s image scaling software, but look closely into the shadows of the bird’s feet at the right. Iridient has clearly gotten the wrinkles better defined and crisper. The same applies pretty much to all low level detail, and especially on greens. The problem for Fujifilm is that it’s going up against really good 24mp crop sensor cameras, ones without AA filters that can pull up shadows and detail better than the X-Trans sensors are. I shot the X-T1 side-by-side with the Nikon D7100 in the Galapagos for two weeks. Simply put, I can pull more detail out of the D7100 images, and by enough of a margin to make that my preference. In terms of noise handling, the X-T1 may be a bit better, but Fujifilm is also using a lot of noise reduction on top of the extra luminance points to achieve this in JPEGs, and even cooks high ISO raws a bit. In terms of noise, the X-T1 generally doesn’t produce much. The extra luminosity values help, sure, but Fujifilm also has a very well tuned noise reduction scheme that doesn’t really show its impact on detail until about ISO 3200. Of course, ISO 3200 on my X-T1 requires a longer shutter speed to get the same density of exposure than on my D7100 ;~). Thus, ISO 3200 isn’t actually ISO 3200 when you compare two cameras. Things get really tricky to explain when you start trying to factor in the DR expansion modes, but I’d say that the X-T1’s marked ISO values will likely be a minimum of a half stop from other cameras you might be using, possibly more depending upon the camera. That said, noise propensity should still be considered quite low. Moreover, you don’t tend to get patterned noise or chroma noise at ISO values that the traditional Bayer competitors will start showing it. However, having been able to compare an X-A1 against an X-M1, where the only real difference in the cameras was a Bayer sensor versus an X-Trans sensor, I’d tend to say that the X-Trans advantage is not particularly large. It may only be a third of a stop when all is said and done. Moreover, for raw files Fujifilm “cooks” them at ISO 6400, and the way they do that produces visible smudge artifacting. And another Adobe converter warning: color fidelity starts to go out the door as you bump ISO. The in-camera JPEGs do a far better job of not blocking up color at higher ISO values, while Adobe clearly blocks up color at higher ISO values. One final image quality point: Fujifilm made a big point of “no moire with X-Trans” when they introduced it. Having now had a lot of experience with the sensor I can tell you that it most certainly can produce moire. It tends to do so at a different frequency and will less regularity than the Bayer sensor, but it’s still possible to generate false artifacts on fine, tight detail. The good news is that the moire doesn’t tend to have a color component to it. So I’m still not a huge fan of the X-Trans sensor. It has some pluses, but it also has minuses. Moreover, it’s going up against 24mp sensors that are state-of-the-art. We’ve been down this road before. Back in the Fujifilm DSLR days Fujifilm was using sensor technologies in interesting ways, but the advantage of doing so became less and less clear over time and always seemed to come with a couple of small things that could catch you on certain types of images. I think the old “try to be a bit different and better than Kodak” thing spilled well over into Fujifilm’s digital psyche, but they’ve not exactly pulled off a clear win in pursuing this. Don’t get me wrong, image quality from the Fujifilm X-Trans sensor is good. Quite good. For most people it is clearly well above the “good enough” bar. However, at the high end of a camera lineup you need to be prepared to go up against the best competition, and I feel like the 16mp APS X-Trans is just not fully justifying its differences against 24mp Sony EXMOR technologies. Put another way: if Fujifilm were to use the Sony 24mp sensor in the X-T1, I’d want that over the sensor they used. Okay, so what do I really think? That’s an excellent question, and one I’ve been pondering for quite some time, even before I did extended shooting with the X-T1 in the Galapagos. Let’s face it, there’s much to like. Without a doubt this is the best mirrorless camera Fujifilm has built. They’ve gotten more things right, fewer wrong, and they’ve kept all the best aspects of previous designs while making something that is arguably high-end prosumer. It’s the little things that make you ponder. Moreover, this was one of the most hyped cameras of the past year or two, so expectations started very high. Honestly, I think Fujifilm still has some work to do on focus. Much of the time the camera is very DSLR-like, with the one exception being how fast you can move the focus point to where you want it. Still, side by side with the D7100—which had a slower aperture lens on it—there were just a few many times when the X-T1 was struggling at something while the D7100 didn’t miss a beat. So I’m not going to pronounce the X-T1 as having focus performance at DSLR levels. Yet “world’s fastest" was one of the big marketing hypes Fujifilm made at launch. So we’re in a weird area here. Performance is less good than Fujifilm suggested at announcement, but it’s better than anything they’ve done before and just about anything else in the mirrorless realm other than the Nikon 1. With care and the right lens, it’ll hold its own against the Olympus E-M1, the Panasonic GH4, and the Sony A6000, the other “close to DSLR level” mirrorless cameras at present. So do you praise it for that or fault it for not matching badly set expectations? I think you do both. The big debate in my mind at the moment is whether I keep using the E-M1 as my light backcountry camera or the switch to the X-T1. I suspect that my final answer will all come down to lenses. Right now, m4/3 is winning, but I need to take a look at more of the X options, such as the 12mm Zeiss Touit. For some shooters—I’m thinking wedding and event shooters here—there will be some benefits to the X-T1 over the m4/3 cameras, especially in low light. Both produce nice out of camera JPEGs, but frankly I like the Fujifilm JPEGs a bit more than the Olympus ones, which are a bit too contrasty and saturated for my taste (and when you dial that down with the in-camera settings, something is lost in the process). Certainly with the fast primes the X-T1 is perfectly capable of fast focus that can keep up in event type situations. I only tested that once, but I walked away convinced that I could use the X-T1 much like I do my DSLRs in that circumstance. 16mp isn’t quite enough in today’s competitive megapixel world, and the smearing in the X-Trans pattern in some situations still worries me a bit, even though we’ve gotten better raw converters that are less prone to that. The lens set is great from very wide to portrait telephoto. It’s weak at macro and longer telephoto. Fast motion focus is good, but it has hiccups, such as lower frame rates and big trouble reacquiring lost focus during tracking. Plus I just don’t have enough fingertip control of what the focus system is doing. If you can get by those things, I’d give the X-T1 a Highly Recommended rating. It’s a very nice, well-made camera that could use a few minor tweaks to make it near perfect from the handling standpoint. But especially if those last two bullets intersect with your biggest needs, then I’d be at Recommended (with caveats). See my problem? In the end the X-T1 isn’t everyone’s dream camera. It may be the dream camera for some, but it also might be others’ more frustrating camera. What I will say is that I took a lot of very good shots with the camera in the course of testing it. Shots I’d be proud of in my portfolio, and that can’t be bad at all, can it? I like where Fujifilm is going. I want them to keep going further. 2018: this model is out of production and no longer available new. But used copies can easily be found. Also, check out the current X-T2 model.